There have been numerous Dalai Lamas throughout history. Depicted here is the Eight Dalai Lama, Jamphel Gyatso, who reigned from 1786-1804. The Dalai Lama (meaning "Ocean of Wisdom") is an institution of great importance in Tibetan Buddhism, whose incumbent is considered to be the spiritual figurehead of the Tibetan people. In addition to his supreme religious and temporal authority, the Dalai Lama is also widely revered as an incarnation of the bodhisattva Avalokitesvara ("Chenrezig" in Tibetan), known as the embodiment of compassion. All four schools of Tibetan Buddhism respect the Dalai Lama, although he is especially important within the Gelug sect. Historically, the title of the Dalai Lama was introduced in 1578 C.E. when Altan Khan of the Mongols bestowed it upon Sonam Gyatso (1543–1588), the third leader of the Geluk school of Tibetan Buddhism, commonly called the Yellow Hat sect. The title was then retroactively given to his two predecessors dating back to 1391 C.E. Ever since that time, it is believed that the institution of the Dalai Lama has been maintained through a successive lineage of reborn Tulkus. Between the 17th century and 1959, the Dalai Lama was the head of the Tibetan government, administering a large portion of the country from the capital of Lhasa. Since 1959, however, the current Dalai Lama, Tenzin Gyatso, has lived in exile from his homeland due to the Chinese takeover of the country. It should be noted that the institution of the Dalai Lama is much older than the current incumbent of the position, Tenzin Gyatso, the 14th Dalai Lama. In 1989, the 14th Dalai Lama won the Nobel Peace Prize for his efforts to negotiate a peaceful resolution to the Chinese occupation of Tibet. He is viewed by many as a voice of peace, dialogue, and reason in our modern world. Thus the office of the Dalai Lama commands a great deal of respect and admiration among millions of Buddhists and non-Buddhist alike. While the Dalai Lama is deeply respected today, some of the position's former incumbents were conspicuous for their worldly habits, and the position has not been without controversy, power struggles, and political intrigue. The title "Dalai Lama" (meaning "Ocean of Wisdom") was first used in 1578 when the Mongolian ruler Altan Khan conferred it upon Sonam Gyatso, abbot at the Drepung monastery. However, since Sonam Gyatso was the third member of his lineage, he became known as the "Third Dalai Lama" and the previous two titles were conferred posthumously upon his earlier incarnations. Consequently, the history of the Dalai Lama goes back to Gendun Drup (1391 – 1474) who was posthumously called the first Dalai Lama. Gendun Drup (born Pema Dorje) was the son of nomadic tribespeople, and was raised as a shepherd until the age of seven. 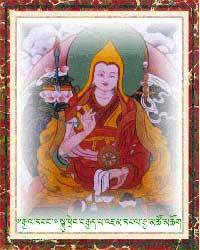 He joined the Nartang (Nar-thang) monastery as a student of Tsongkhapa, and by the middle of his life he had become one of the most esteemed scholar-saints in the country. The second retroactive Dalai Lama was Gendun Gyatso Palzangpo (Wylie transliteration: Dge-'dun Rgya-mtsho), also Gendun Gyatso ("Sublimely Glorious Ocean of Spiritual Aspirants," layname: Yonten Phuntsok) (1475 – 1541). He was proclaimed the reincarnation of Gendun Drup as a young boy. Legend has it that soon after he learned to speak, Gendun Gyatso told his parents his name was Pema Dorje, the birth name of the first Dalai Lama. Later, when he was four, he reportedly told his parents he wished to live in the Tashilhumpo monastery to be with his monks. He became a renowned scholar and composer of mystical poetry, who traveled widely to extend Gelugpa influence, and became abbot of the largest Gelugpa monastery, Drepung, which from this time on was closely associated with the Dalai Lamas. The third Dalai Lama (and the first officially recognized Dala Lama) was Sonam Gyatso (1543 – 1588), a monk of the Gelugpa (Yellow Hat) school of Buddhism. He found a foreign patron for his school in the Altan Khan of Tümed, who issued a Twofold Edict, ordering Mongols to follow orthodox Buddhism, and bestowing on Sonam Gyatso the title "Dalai Lama." The alliance with the Mongols would later prove instrumental in establishing the Gelukpa as the rulers of Tibet during the reign of the Great Fifth Dalai Lama. The fourth Dalai Lama was Yonten Gyatso (1589 – 1616), the grandson of Altan Khan. Yonten Gyatso was a Mongolian, making him the only non-Tibetan to be recognized as Dalai Lama. He was a contemporary and student of the First Panchen Lama Lobsang Chokyi Gyeltsen. The fifth Dalai Lama. Lobsang Gyatso (Wylie transliteration: Blo-bzang Rgya-mtsho) (1617-1682) was the first Dalai Lama to wield effective political power over central Tibet. He unified Tibet under the control of the Geluk school of Tibetan Buddhism, after defeating the rival Kagyu and Jonang sects and the secular ruler, the prince of Shang, in a prolonged civil war. His efforts were successful in part because of aid from Gushi Khan, a powerful Oirat military leader, the Mongol ruler of Khökh Nuur. The Jonang monasteries were either closed or forcibly converted, and that school remained in hiding until the latter part of the twentieth century. The fifth Dalai Lama also initiated the construction of the Potala Palace in Lhasa, and moved the center of government there from Drepung. During his rule, the first Europeans visited Tibet. Two Jesuit missionaries, Johannes Gruber and Albert D'Orville, reached Lhasa in 1661. However, they failed to win any Tibetan converts to Christianity. In 1652, the fifth Dalai Lama visited the Manchu emperor, Shunzhi. The death of the fifth Dalai Lama in 1680 was kept hidden for 15 years by his assistant, confidant, and possibly son Desi Sangay Gyatso (De-srid Sangs-rgyas Rgya-'mtsho). The sixth Dalai Lama, Tsangyang Gyatso, (1683–1706) enjoyed a lifestyle that included drinking, the company of women, and writing love songs. Declaring him to be unworthy as a monk, Mongol leader Lha-bzang Khan invaded Tibet with the approval of China's Kangxi emperor in 1705. The sixth Dalai Lama died soon afterwards, possibly murdered. Tibetans angrily rejected the spurious Dalai Lama candidate that Lha-bzang brought with him and turned to the Dzungar (or Oyrat) Mongols for relief. The Dzungars defeated and killed Lha-bzang, but then proceeded to sack Lhasa and loot the tomb of the fifth Dalai Lama. They stayed until a Chinese expedition expelled them in 1720. The Chinese were hailed as liberators and patrons of Kelzang Gyatso, who they installed as the seventh Dalai Lama. The seventh Dalai Lama of Tibet, Kelzang Gyatso (Wylie: Bskal-bzang Rgya-mtsho) (1708 – 1757), was born in Litang of Eastern Tibet, in the present-day Garzê Tibetan Autonomous Prefecture of present-day Sichuan province, and recognized as the new reincarnation thanks to a poem of the sixth Dalai Lama in which he said, "After going to Litang I would not be late in returning." While still a boy, Kelzang Gyatso demonstrated himself a prodigy of profound wisdom. Kelzang Gyatso became famous for his ability to spontaneously compose verse. Inspired by a sambhogakaya vision of the poet-monk Tsongkhapa, Kelzang Gyatso (while a youth), travelled to central Tibet where he gave a sermon before thousands of people. "Of all the Gyalwa Rinpoche [Dalai Lamas], we Tibetans probably respect the seventh, Kalzang Gyatso, most of all because of his saintliness, because he devoted his whole life to the Three Precious Ones, seeking refuge not for himself but for all his people." The Dzungars invaded Tibet in 1717, deposed and killed a pretender to the position of Dalai Lama (who had been promoted by Lhabzang, the titular King of Tibet), which met with widespread approval. However, they soon began to loot the holy places of Lhasa which brought a swift response from Emperor Kangxi in 1718, but his military expedition was annihilated by the Dzungars not far from Lhasa. A second, larger, expedition sent by Emperor Kangxi expelled the Dzungars from Tibet in 1720 and the troops were hailed as liberators. They brought Kelzang Gyatso with them from Kumbum to Lhasa and he was installed as the seventh Dalai Lama in 1721. Emperor Kangxi (1622-1723) declared Tibet a protectorate and in 1727 installed two high commissioners, or ambans, and a garrison of Chinese troops in Lhasa. The walls of Lhasa were torn down and "Kham (with Batang, Litang, Tatsienlu, etc.) annexed to the Chinese province of Szechwan. The Chinese protectorate, which was to last till the end of the Ch'ing dynasty (1912), was established." The seventh Dalai Lama was enthroned in the Potala Palace in 1720. He took the novice vows of monk-hood from the fifth Panchen Lama Lobsang Yeshi, who gave him the name Kelsang Gyatso. He took the Gelong vows (full ordination) from Lobsang Yeshi in 1726. He received teachings from the tutor of Lobsang Yeshi, the Abbot of Gyumey Monastery and also from the Abbot of Shalu Monastery, Ngawang Yonten on all the major Buddhist philosophical treatises and became a master in both sutra and tantra. He was a great scholar and wrote many books, especially on the tantra. The eight Dalai Lama was Jamphel Gyatso (1758 – 1804). He is renowned for several miraculous signs that indicated his special nature. For example, it is said that as a baby he often attempted to sit in a meditative posture looking up to the heavens. When Lobsang Palden Yeshi, the Sixth Panchen Lama, heard about this boy, he pronounced that he was indeed the authentic reincarnation of the Dalai Lama. At the age two and a half years old, Jamphel was taken under a large contingent of lamas and officials to Tashilhunpo Monastery in Shigatse, and was given a ceremony as the reborn Dalai Lama. He was escorted to Lhasa and enthroned as the leader of the Tibetan people in the Potala Palace when he was five years old (four by Western reckoning). The enthronement ceremony was presided over by Demo Tulku Jamphel Yeshi, the first of a series of Regents to represent the Dalai Lamas when they were minors. The ceremony was held in the 'Beyond Mind Temple of the Second Potala'. Shortly after, he was given the novice vows of monk-hood the name, Jamphel Gyatso, by Lobsang Palden Yeshe, and was fully ordained in 1777. The country of Tibet continued to be ruled by regents until 1784 when the Regent was sent as an ambassador to China and the Dalai Lama ruled alone until 1790, when the Regent returned to help Jamphel Gyatso. In 1788, there was a conflict with Nepali wool traders leading to a skirmish with the Gurkhas. In 1790, the Gurkhas invaded southern Tibet and conquered several provinces including Nya-nang and Kyi-drong. The city of Shigatse and the Tashilhunpo Monastery were captured and looted but the Gurkhas were driven back to Nepal in 1791. A peace treaty between the two was agreed on in 1796. It was the eighth Dalai Lama who built the Norbulingka Park and Summer Palace on the outskirts of Lhasa. He died in 1804 at the age of 47 (46 by Western reckoning). The ninth Dalai Lama was Lungtok Gyatso (1806 – 1815), who was recognized as the reincarnation of the eighth Dalai Lama and was escorted to Lhasa with great ceremony. In 1810, he was enthroned at the Potala Palace on the Golden Throne of the Ganden Po-drang Government. He took his novice vows from the Panchen Lama, who gave him the name Lungtok Gyatso. "The English explorer Thomas Manning, who reached Lhasa in 1812, described his meeting with the 9th Dalai Lama, who was seven years old at the time, in rhapsodic terms. 'The lama's beautiful and interesting face engrossed all my attention,' Manning wrote. 'He had the simple, unaffected manners of a well-educated princely child. His face was, I thought, affectingly beautiful. He was of a gay and cheerful disposition. I was extremely affected by this interview with the lama. I could have wept through strangeness of sensation.'" Unfortunately, he served only briefly owing to his death at the age of nine in 1815. "The entire nation was plunged into sorrow," which lasted until the recognition of the new reincarnation eight years later. In 1792, the Qianlong Emperor outlined a new method to select the Dalai Lama by means of a lottery. The names of the competing candidates were written on folded slips of paper which were placed in a golden urn. The tenth, eleventh and twelfth Dalai Lamas were selected by the golden urn method. The thirteen, and fourteenth Dalai Lamas, however, were selected by the previous incarnation's entourage, or labrang, with the selection being approved after the fact by the Chinese rulers in Beijing. In 1910, the Qing government sent a military expedition of its own to establish direct Chinese rule and deposed the Dalai Lama in an imperial edict. The Dalai Lama fled to India. In early 1913, the Dalai Lama returned to Lhasa and issued a proclamation that condemned, "The Chinese intention of colonizing Tibet under the patron-priest relationship" and stated that, "We are a small, religious, and independent nation." 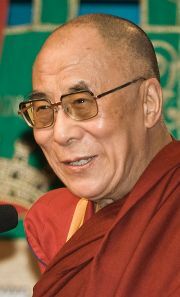 The 14th and current Dalai Lama, Tenzin Gyatso (born 1935). The current Dalai Lama, the fourteenth in the lineage, is Tenzin Gyatso (born July 6, 1935), a practicing member of the Gelug School of Tibetan Buddhism. He was proclaimed the tulku (rebirth) of the thirteenth Dalai Lama at the age of two. On November 17, 1950, at the age of 15, he was enthroned as Tibet's Head of State. Thus he became Tibet's most important political ruler just one month after the People's Republic of China's invasion of Tibet on October 7, 1950. In 1954, he went to Beijing to talk with Mao Zedong. However, after a failed uprising and the collapse of the Tibetan resistance movement in 1959, the Dalai Lama left for India, where he was active in establishing the Central Tibetan Administration (the Tibetan Government in Exile) and in seeking to preserve Tibetan culture and education among the thousands of refugees who accompanied him. Tenzin Gyatso is a charismatic figure and noted public speaker. He is the first Dalai Lama to travel to the West where he has helped to spread Tibetan Buddhism and to promote the concepts of universal responsibility, secular ethics, and religious harmony. He remains influential as a Nobel Peace Prize laureate, as the world's most famous Buddhist monk, and as the leader of the exiled Tibetan government in India. The title "Dalai Lama" is usually translated as meaning "Ocean of Wisdom." In addition to this title, the Dalai Lama is also called Gyalwa Rinpoche (Rgyal-ba Rin-po-che) meaning "Precious Victor," and Yishin Norbu (Yid-bzhin Nor-bu) meaning "Wish-fulfilling Jewel." In English, the words "His Holiness" (H.H.) are often placed before his title. Starting with the fifth Dalai Lama and until the fourteenth Dalai Lama's flight into exile in 1959, the Dalai Lamas resided during winter at the Potala Palace, and in the summer at the Norbulingka palace. 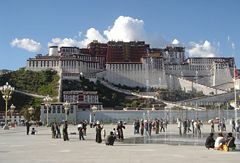 Both residences are located in Lhasa, Tibet, approximately three km apart. In 1959, subsequent to the then ongoing Chinese occupation of Tibet, the 14th Dalai Lama sought refuge within India. The then Indian Prime Minister, Jawaharlal Nehru, was instrumental in granting safe refuge to the Dalai Lama and his fellow Tibetans. The Dalai Lama has since been living in exile in Dharamsala, where the Central Tibetan Administration (Government in Exile) is also established. Tibetan refugees have constructed and opened many schools and Buddhist temples in Dharamsala. Throne awaiting Dalai Lama's return. Summer residence of 13th Dalai Lama, Nechung, Tibet. Traditionally, upon the death of a Dalai Lama, a search commences for the tulku's rebirth, or yangsi (yang srid). Familiarity with the possessions of the previous Dalai Lama is considered the main sign of the new candidate. The search for the new Dalai Lama typically takes a few years. The new candidate is then brought to Lhasa to be invested with the title and trained by other Lamas. Despite its officially secular stance, the government of the People's Republic of China (PRC) has claimed the power to approve the naming of high lamas in Tibet. This decision cites a precedent set by the Qianlong Emperor of the Qing Dynasty, who instituted a system of selecting the Dalai Lama and the Panchen Lama by means of a lottery that utilized a golden urn with names wrapped in barley balls. Controversially, this precedent was called upon by the PRC to name their own Panchen Lama. The Dalai Lama and the majority of Tibetan Buddhists in exile do not regard this to be the legitimate Panchen Lama. The Dalai Lama has recognized a different child, Gedhun Choekyi Nyima, as the reincarnated Panchen Lama. This child and his family have been taken into 'protective custody' according to the PRC, and all attempts to garner guarantees of the family's safety have been denied by the PRC. There is some speculation that with the death of the current Dalai Lama, the People's Republic of China will attempt to direct the selection of a successor, using the authority of their chosen Panchen Lama. The current Dalai Lama has repeatedly stated that he will never be reborn inside territory controlled by the People's Republic of China, and has occasionally suggested that he might choose to be the last Dalai Lama by not being reborn at all. However, he has also stated that the purpose of his repeated incarnations is to continue unfinished work and, as such, if the situation in Tibet remains unchanged, it is very likely that he will be reborn to finish his work. ↑ The Dalai Lama is often thought to be the head of the Geluk sect, but this position officially belongs to the Ganden Tripa (Dga'-ldan Khri-pa). ↑ His Holiness the Dalai Lama, Foundation for the Preservation of the Mahayana Tradition. Retrieved July 2, 2008. ↑ For a fuller account of the life of the current Dalai Lama, see Tenzin Gyatso, 14th Dalai Lama. ↑ The Sixth Dalai Lama, Tsangyang Gyatso, was from Monpa stock, which can be seen either as a Tibetan subgroup or a closely related people. ↑ Other Christian missionaries spent time in Tibet, with equal lack of success, until all were expelled in 1745. ↑ Thubten Jigme Norbu, and Colin M. Turnbull. (1968). Tibet: An account of the history, the religion and the people of Tibet. (Reprint: New York: Touchstone Books. ISBN 0671205595), 311. ↑ Hugh E. Richardson. (1984). Tibet and its History, Second Edition, Revised and Updated. (Boston; London: Shambhala. ISBN 0877733767), 48-49. ↑ R. A. Stein. Tibetan Civilization. (1972), (Stanford University Press. ISBN 0804708061), 85. ↑ Bradley Mayhew, and Michael Kohn. Tibet, 6th Edition. (Lonely Planet Publications, 2005), 31. ↑ R. A. Stein. Tibetan Civilization. (Stanford University Press, 1972), 85. ↑ "The Eighth Dalai Lama JAMPHEL GYATSO" Namgyalmonastery. Retrieved July 2, 2008. ↑ "The Eighth Dalai Lama JAMPHEL GYATSO." . Retrieved July 2, 2008. ↑ Khetsun Sangpo Rinpoche. (1982). "Life and times of the Eighth to Twelfth Dalai Lamas." The Tibet Journal VII (1 & 2) (Spring/Summer 1982): 47. ↑ "The Eighth Dalai Lama JAMPHEL GYATSO" Namgyalmonastery.org. Retrieved July 2, 2008. ↑ Khetsun Sangpo Rinpoche. (1982). "Life and times of the Eighth to Twelfth Dalai Lamas." The Tibet Journal VII (1 & 2) (Spring/Summer 1982): 47-48. ↑ Mick Brown. The Dance of 17 Lives: The Incredible True Story of Tibet's 17th Karmapa. (New York, NY: Bloomsbury Publishing, 2004. ISBN 158234177X), 28-29. ↑ Khetsun Sangpo Rinpoche. (1982). "Life and times of the Eighth to Twelfth Dalai Lamas." The Tibet Journal VII (1 & 2) (Spring/Summer 1982): 49. ↑ "Proclamation Issued by His Holiness the Dalai Lama XIII (1913)". Tibet Justice Center. Retrieved July 2, 2008. ↑ The Dalai Lama's biography.tibet.com. Retrieved July 2, 2008. ↑ 26.0 26.1 26.2 The title "Dalai Lama" was conferred posthumously to the first and second Dalai Lamas. The 9th Dalai Lama was officially enthroned, but never reigned. ↑ A Guide to Little Lhasa in IndiaThe Government of Tibet in Exile. Retrieved July 2, 2008. ↑ Buddhist Temples Dharamsala. Retrieved July 2, 2008. ↑ Questions & Answers, The Website of The Office of His Holiness the 14th Dalai Lama. Retrieved July 2, 2008. Essence of Refined Gold by the Third Dalai Lama: with related texts by the Second and Seventh Dalai Lamas, Translated by Glenn H. Mullin. Dharamsala, H.P., India: Tushita Books, 1978. Mayhew, Bradley, and Michael Kohn. Tibet, 6th Edition. Lonely Planet Publications, 2005, ISBN 1740595238. Rinpoche, Khetsun Sangpo (1982). "Life and times of the Eighth to Twelfth Dalai Lamas." The Tibet Journal VII (1 & 2) (Spring/Summer 1982): 47-48. This page was last modified on 17 November 2017, at 16:59.